Last weekend I went on a mini-vacation with my family to Chicago. We only live a few hours away, so it’s a perfect place to go when you want to visit a big city but don’t have much time. Our first stop was the French Market - filled with string lights, beautiful little shops, and drool-worthy chocolate and macarons. We first picked up some crepes. I thoroughly enjoyed my first savory crepe - the Atlantic Salmon from Flip Crepes. It had: Nova lox smoked salmon, tomatoes, cucumbers, red onion, and spinach. It was huge! I almost didn’t have room for macarons from Delightful Pastries… almost. They were only $1.50 each, so I grabbed a pistachio and a lemon. So good! After a stop back at our hotel, my mom headed to the House of Blues for a LANY concert, and my dad, brother, and I headed to the river for an architecture boat tour. 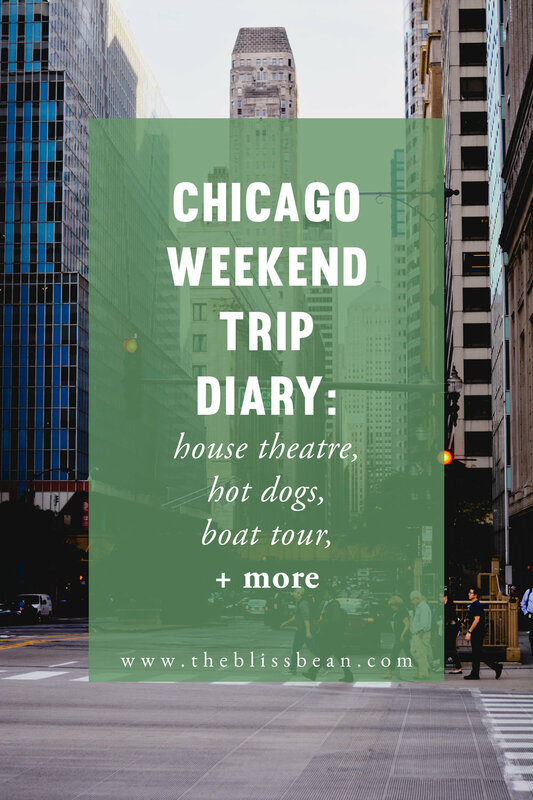 You’d think that after more than 10 years of living close to Chicago and countless trips downtown that we would have done this before, but nope! We went with Shoreline Sightseeing for our turn at the classic tourist experience. I highly recommend choosing a time right around sunset so that you get to see the city in the daytime and at night. I was BLOWN AWAY by the sunset view. A photo honestly could not capture it. The entire sky was pink purple and the city was glittering. I felt so small amongst the humongous buildings. It was like a dream. After that, the family met up at Portillo’s Hot Dogs for some of their ~famous~ dogs. If ya ask me, it’s just a regular hot dog, but I was starved so I had two and split a chocolate cake shake (incredible). The next day we fueled up at Eataly. We had a sandwich each and then… wait for it… NUTELLA CREPES. I haven’t had Nutella in a long time because, well, it’s not great for you. I’d say it’s bad for you. So much sugar. But boy oh boy was it incredible. It was such a big pancake but with all those juicy strawberries it went down faster than you can say “21 grams of sugar per serving”. Regrets? None. With all of that food in our bellies, we walked down to the Navy Pier and rented out a quadcycle, and went on a little journey down the lake. The weather was cool and sunshiney, and so many people were out riding bikes and jogging. Afterwards, we hung out at the little park nearby while we tried to figure out if there were still play tickets available for House Theatre’s Flight 232. I practiced backbends and handstands on the green grass, met the cutest freaking bulldog puppy in the world named Oliver, and just enjoyed the fresh air. We found out that tickets were sold out, but that there was a waiting list we could get on. So we hopped in an Uber and sped down there. A few minutes before the show, they called out names from the waiting list. We sat tensely, crossing everything that we could possibly cross and hoping hoping hoping. The chances weren’t great; We were a family of four. But then- WE GOT IN! We were so happy. The play was about a tragic plane crash and told the stories of the pilots, flight attendants, and passengers. Their only props, really, were chairs and lights. It was incredible. I cried. After the show, my very charismatic 10-year-old brother began talking to one of the “flight attendants”, who was very impressed with his knowledge of and interest in aviation history. She called over the woman who played the head flight attendant. They brought out the model plane that was used in parts of the play for him to see. Then, they got all of the guys who played the pilots to come and take a picture with him holding the plane. I stood by, amazed at how good my brother was at this. When he left, his day was absolutely made. His week was made. He couldn’t stop gushing about it. Hungry, we went to a nearby Mexican restaurant, XOCO, and ate a big dinner. Personally, I was disappointed that we didn’t get any guacamole (I mean, that’s a CRIME), but we had already ordered enough food. As an appetizer we got the tlayuda, which was basically a gigantic, pizza-sized tortilla chip doused in interesting toppings (not your average nacho cheese). I got the Baja Chicken sandwich, which was really yummy, but the desserts were the real star of the show. We got a beautiful slice of butternut squash cake, and CHURROS. Only a Boomerang can suffice to show you these gorgeous churros. My mom wasn’t a big fan of the slight taste of corn, but I loved it. It reminded you of a corn tortilla, and felt much more ~authentic~ than the churros we had at Disneyland, for example. By the time we were done eating, I was dying to get out of there. My head hurt and the LOUD music and chatter was killing me. We stepped out into the quieter, cool air and speed-walked down to the Arts in the Dark parade we’d planned to attend. We arrived to the clean-up crews beginning work, so we headed back to the Bean to watch people in costumes dancing to a DJ. On the way back to the hotel we popped into the legendary Apple store on Michigan Avenue. Mind blown. Sunday was pretty chill. We had a delicious breakfast at a Protein Bar, then got in our car to drive to West Elm and IKEA for a little bit of shopping. On the way back, I started stressing about the week ahead of me. Didn’t help that I was behind on homework and had 3 tests waiting for me. Plus, we had spent too much time in Chicago and I was going to be late to a board meeting for a club I’m part of. That stress coupled with the sugar I had consumed = MIGRAINE! It was bound to happen eventually, I’m just surprised it didn’t happen earlier. I felt like crap, and went straight to bed after the meeting, waking up refreshed after 9 hours of sleep. I talked a bit more about these migraines in my water blog post. Q: What's your favorite big city? Have an awesome rest of your Sunday!